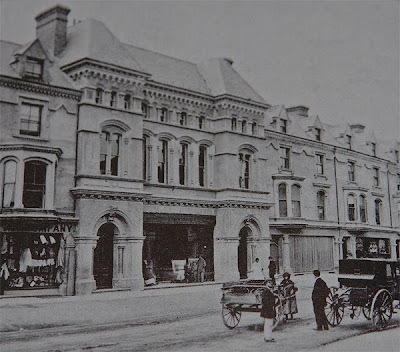 Not that many people are aware that the premises of HMV in Mostyn Street was originally built as the St. George's Hall (later the Princes Theatre) back in 1864. By the 1920s, its glory days as a theatre were long over and it had become a cinema called the New Princes Theatre. It finally closed sometime in the 1960s, when the ground floor frontage was ripped out and converted to a shop, the Maypole. Later, it became a Liptons supermarket (with a cafe on the first floor), then FarmFoods, then Lo-Cost. 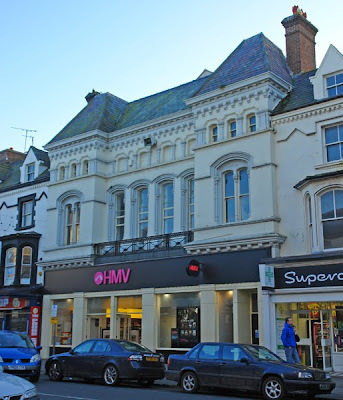 Finally, in 2004, the building was refurbished and a more sympathetic shopfront added when it became a branch of the HMV music retailer. You can still see a domed ceiling through the first floor windows, if you look carefully. And I recall a member on the Llandudno forum saying that he once came across the old Princes Theatre sign dumped in a quarry up by Nant Y Gamar woods!